Who comes up with these ideas? With whom do they hash these out or look them over? Because any reasonable person could have seen this one coming from a mile away. 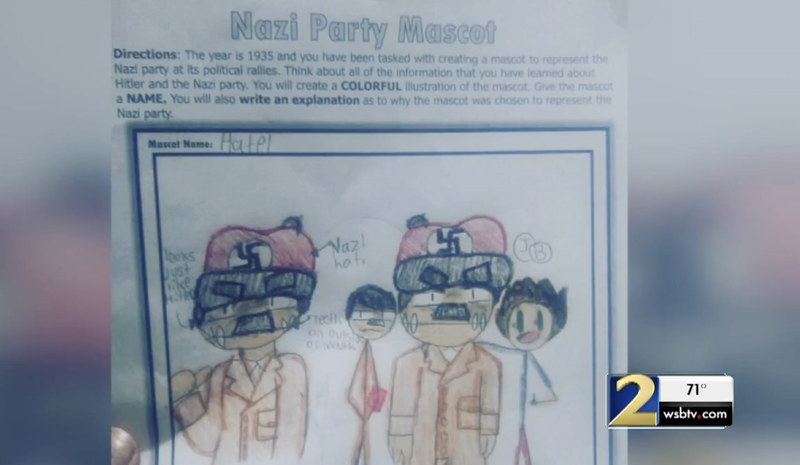 Nonetheless, a Gwinnett County, Ga., schoolteacher is under scrutiny after thinking it was a great idea to give sixth-graders a homework assignment that tasked them with drawing a Nazi mascot. Don’t worry. It was a colorful Nazi mascot. It had to be fashionable, none of that drab nonsense. According to the Atlanta Journal-Constitution, the assignment was given out Monday at Shiloh Middle School. A parent quickly reached out to Gwinnett school officials to question the exercise. The year is 1935 and you have been tasked with creating a mascot to represent the Nazi party at its political rallies. Think about all of the information you have learned about Hitler and the Nazi party. You will create a COLORFUL illustration of the mascot. Give the mascot a NAME. You will also write an explanation as to why the mascot was chosen to represent the Nazi party. The president of the Atlanta NAACP said the assignment didn’t make any sense, according to WSB-TV. “When you think about a mascot for something, you think it’s a good thing—mascot for your college, mascot for your high school. This is nothing to celebrate,” the NAACP’s Richard Rose said. Gwinnett County officials said that the teacher, who remains unidentified, was teaching a social studies class, and the class was covering some of the rise of Nazism and the use of propaganda and events that ultimately led to the Holocaust. “This assignment is not a part of the approved materials used by our social studies department and is not appropriate, and the school is addressing the use of this assignment with the teacher,” school district spokeswoman Sloan Roach told AJC. Read more at the Atlanta Journal-Constitution and WSB-TV.